Get a plan custom made for you and your goal. Each runner is different. We all have different strengths and weaknesses, different goals and time constraints. I don’t believe there’s a perfect one-size-fits-all training plan that works for everyone. That’s why I take the time to understand a runner before writing a plan for them from scratch. If you have a goal in mind and want a training plan that’s tailored to your lifestyle, likes and dislikes, I can write one for you. Plans can be for any race distance and any number of weeks. After discussing your running background, injury history and goals, I’ll create a plan tailored to you. You choose how long you want your plan to be, how many days a week you can train and tell me any weeks where training might be tricky, then I’ll work it all out. This option gives you your training plan all in one go and does not include any updates or email/phone contact along the way. Laura created a 16-week training plan for my second ever half-marathon. She kept the workouts interesting and challenging and factored in a weekly running commitment I already have. Thanks to Laura’s help I achieved a PB by 15 minutes! 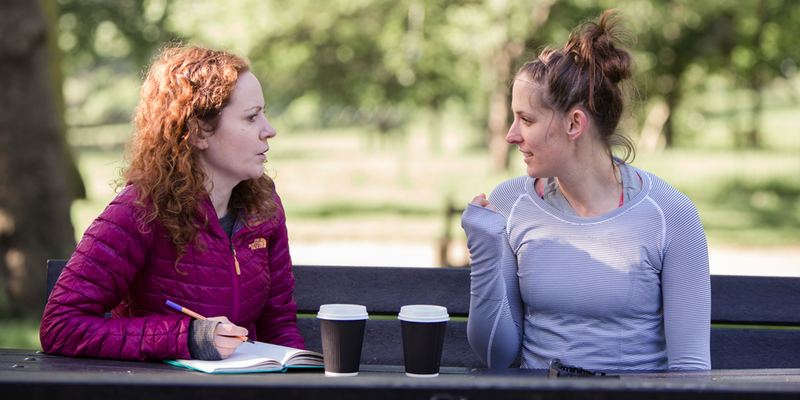 As a newish runner I found some training plans really intimidating, but Laura made the whole thing feel really accessible, even all the tricky things I thought I’d never understand – like sprints and surges. I can’t wait to use Laura’s training plans again to help me train and prepare for my first marathon! I went to Laura looking for an 8-week half-marathon training plan that would challenge me but still leave time for plenty of cross training. She took my preferences and past experience into consideration, and came up with one that was so achievable that (for the first time) I followed a plan to the letter, even the dreaded speed sessions. The result was a PB by more than 6 minutes on a hilly course which I finished feeling strong and very happy!